How does energy and temperature affect reaction rates? I grew interest from this topic when I sought to gain a deeper and more clear understanding of how energy and temperature affect the rate of a reaction. On a molecular level, bonds must be broken (H-H and Cl-Cl) before the reaction can proceed too far into products. This means that as the reactant molecules come together, the collision must have enough energy to initiate the bond breakage for the reaction to occur. Not all collisions will have this amount of energy. The collisions that do not have sufficient energy to react end up as elastic scattering events. Dictionary.com shows that Elastic suggests that it is able to maintain its shape or speed after a collision. Only collisions with enough energy react to form products. The energy of the system changes as the reactants approach each other. The critical amount of energy to make the reaction proceed is called the Activation Energy. 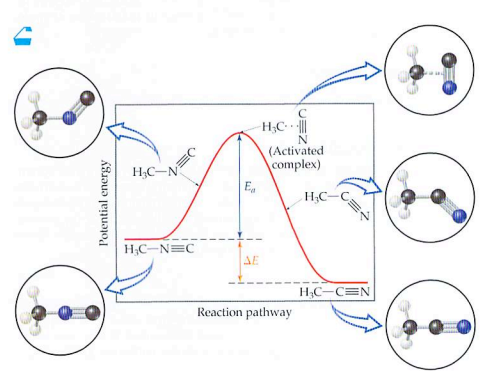 The picture below comes from our chemistry textbook and details the amount of energy needed in a reaction. Ea is depicted as our activation energy or the amount of energy needed for the reaction to occur. R represents the gas constant. T represents temperature. What is important to take from this is that when you conduct a reaction at a higher temperature, you deliver more energy into the system and increase the reaction rate by causing more collisions between particles, as explained by collision theory. However, the main reason that temperature increases the rate of reaction is that more of the colliding particles will have the necessary activation energy (Ea) resulting in more successful collisions (when bonds are formed between reactants). Coal burns in a fireplace in the presence of oxygen, but it does not when it is stored at room temperature. The reaction is spontaneous at low and high temperatures but at room temperature its rate is so slow that it is negligible. The increase in temperature, as created by a match, allows the reaction to start and then it heats itself, because it is exothermic. That is valid for many other fuels, such as methane, butane, and hydrogen. Well you seen like a bright young man, and I foresee a great future for you. The one thing i will comment upon pertains to to your final example about the coal. The fact the reaction is spontaneous also has to do with Gibbs Free Energy (if you will recall ΔG=ΔH-T(ΔS). Keep up the good work young man and i look forward to your next post! !